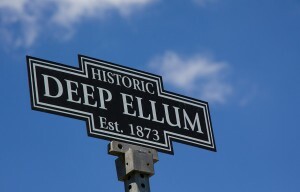 Located a short distance east of downtown Dallas is the historic area of Deep Ellum. It’s one of the oldest neigbourhoods in the city and has a long history of being an entertainment and nightlife centre. Today, it’s an eclectic blend of retail shops, bars, coffee houses, and art galleries housed in converted warehouses. Centering on Elm, Main, and Commerce Streets, this small 5-block neighbourhood is also the epicenter for street art in Dallas. Colourful pieces adorn building walls, garage doors, and even the pillars of the Good-Latimer Expressway. Having fallen in love with this art form and explored street art in various cities over the past couple of years, I had to take a few hours to wander through the neighbourhood. Below are a number of photos I captured from the area. How to Get There: Take the Green Line on the Dallas DART system to Deep Ellum Station and walk east. Don’t forget to wear a good pair of walking shoes! There’s also a lot of great street art under the Good-Latimer Expressway. A few of the pieces painted on the pillars of the Good-Latimer Expressway. Festival Alert: If you’re in Dallas in early April, check out the Deep Ellum Arts Festival. This yearly festival is one of the largest performing and visual arts festivals in the region.